The monster suffrage petition contained the signatures of more than 25,000 women. A dozen other, smaller petitions were also submitted around the same time. When pro-suffrage MP Sir John Hall presented them to the House of Representatives on 11 August, he noted that together they contained the signatures of nearly 32,000 women − almost a quarter of the adult European female population of New Zealand. The Women’s Christian Temperance Union and other organisations had campaigned for women’s right to vote since the mid-1880s. In 1891 they presented to Parliament eight petitions containing more than 9000 signatures, and in 1892 six petitions containing almost 20,000. On both occasions, opponents in the more conservative upper house, the Legislative Council, defeated electoral bills that would have enfranchised all adult women. This time the outcome would be different. When the governor signed a new Electoral Act into law (see 19 September), New Zealand became the first self-governing country in which women had the right to vote in parliamentary elections. 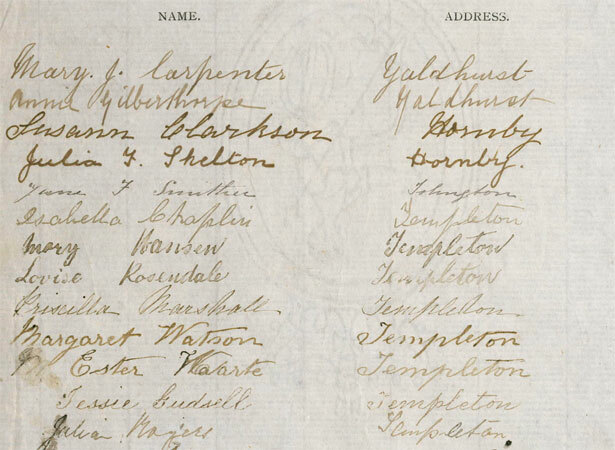 You can now search a database of the signatures from the 1893 petition here. We have 16 biographies, 6 articles, related to Massive women’s suffrage petition presented to Parliament.